1. Concerto: at 20:34 he used the brolly (first fight ever?) as an extension of his arm to put back a curtain behind which an opponent was hidden and knocks him out with a brolly blow in the stomach and into the pit afterward. At 26:50 Steed hits an opponent at the club with a punch in the back and pulls his leg away, so he stumbles. 2. The Grandeur that was Rome: The only scene with Steed using his short umbrella sword in the final scene. 3. 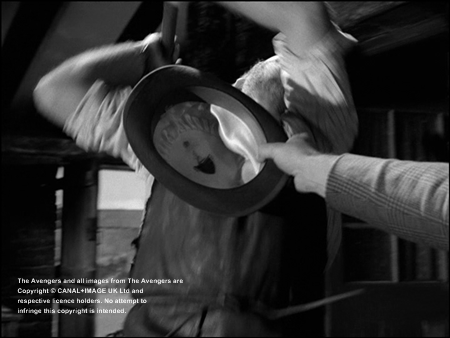 The Undertakers: at 41:42 he's blocking the attacker and sets several blows on arms, back and upper body of his opponent who was stupid enough to attack Steed without a weapon. 4. 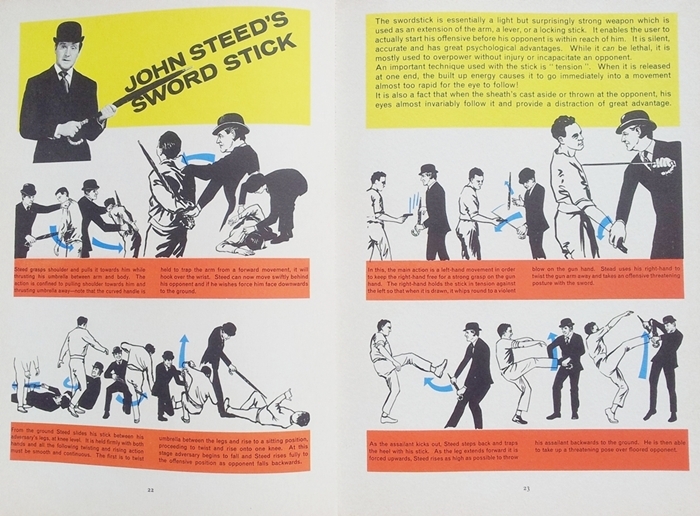 The White Elephant: Steed get's attacked with a knife and uses his brolly to defend himself, but is not able to disarm the attacker with the brolly. 5. 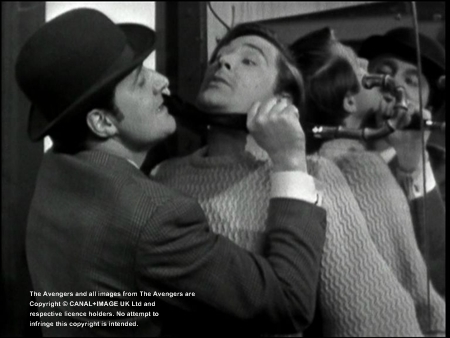 Mandrake: 45:13 young Benson attacks Steed with a knife, gets disarmed by Steed, and he presses the brolly against Benson's throat. 6. The Charmers: Steed is using a brolly (not his own) during a fight at the Charmers school. He picks up a brolly from then bottom when he get's attacked with a blade. He opens the brolly and presses his opponent against the wall, then knocks him out. too far away to attack him or to surprise the opponent. Allows Steed to keep the opponent at distance and to disarm or knock him out, most efficiently done at the back, the spine, or the kidneys. Very efficient on the arm or on the sternum, instantly knocks out even the biggest man. Can be used to pull off hands, legs or feet of the opponent or for disarming him. Knock out the enemy in the split of a second; extremely efficient when done in teamwork. Steed had to knock out poor Tara that way. Ramming the tip of the brolly in the opponent's guts. Bringing the opponent out of balance using the handle.